Connecting a Linksys Wireless router to another router that supplies DHCP. If there is already a router or a router/IAD acting as a DHCP server on your network then you will want to disable DHCP from the second router, in this case the wireless router. This is an important step because double NAT can cause unwanted issues on your network and can become especially troublesome for VoIP networks. Even if at first you receive dial tone and are able to make good quality two-way audio calls if you do not disable NAT on all other routers, except the primary NAT router, then issues will eventually happen. 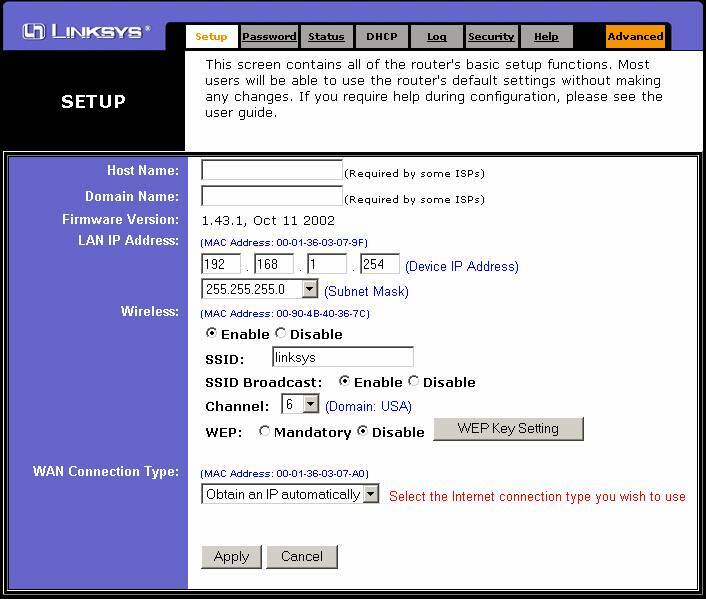 The first step in configuring the Linksys router would be to connect an Ethernet cable directly from a computer to one of the four numbered Ethernet ports in the Linksys wireless router. Then power up the wireless router and then power up the computer. After the computer has opened to itís desktop, double click on Internet Explorer and let it completely open. It may display ìPage cannot be Displayedî, but that is all right. Type the following address into the address bar of Internet Explorer http://192.168.1.1 and click on go. A Setup page should display in Internet Explorer. 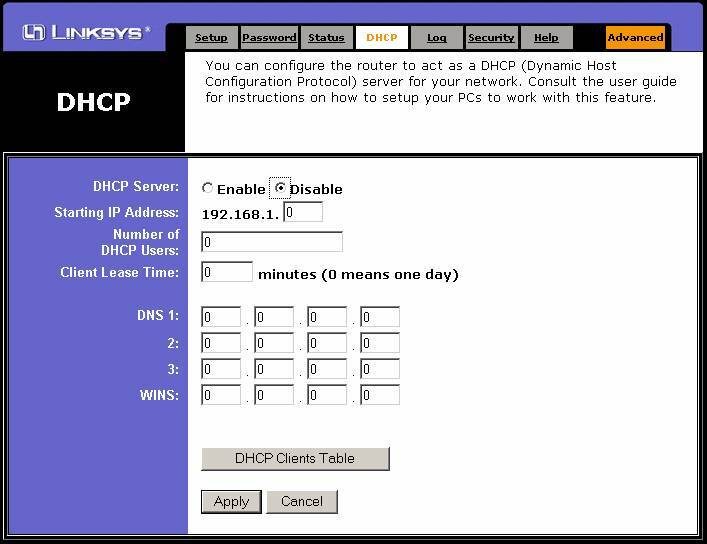 Depending on the firmware version that you have, you may see a DHCP Server check box or a DHCP tab. If you have the checkbox, uncheck or disable it. If you have a DHCP tab, click on it and Disable DHCP Server. Click on the Apply button. Then Continue, if prompted. Return to the setup page. There you will need to change the LAN IP address to one that will correspond to the other routers subnet. For example, if the other router's IP address is 192.168.1.1, then you could change the wireless router's LAN address to 192.168.1.254. If the other router's LAN address is 192.168.15.1, then you should use one that will correspond to it's subnet like 192.168.15.254. Connecting the two devices. Un-power both devices and put an Ethernet cable into one of the regular ports of the first router which will act as the DHCP server. Connect the other end of this Ethernet cable into the Uplink port or the wireless router. If your version Linksys router does not have an uplink port then connect it into a regular Ethernet port. Power up the routers. You should get a Link LED on the main router's port where the wireless router is plugged in.